Don't assume all students are straight and cisgender. Don't assume being LGBTQ is a problem. Don't "out" people. A student may be out with a few trusted people at school, but may not be out at home. Allow students to self-identify. Labels may change as young people discover the identity that fits. Don't make assumptions about students' gender identity. Watch for connotative bias. Phrases like "sexual preference" or "alternative lifestyle" suggest a choice. Consider the power of words. Phrases like "that's so gay" suggest being gay is bad. Avoid negative expressions about gender (such as "man up," "you throw like a girl," "don't be a sissy"). Be careful about unintentional heterosexism (try "date" instead of boyfriend or girlfriend, "parents" for mom and dad, or "spouse" for husband or wife). Weinberg, Michael (2009). LGBT-Inclusive Language. English Journal, 98(4), 50-51. 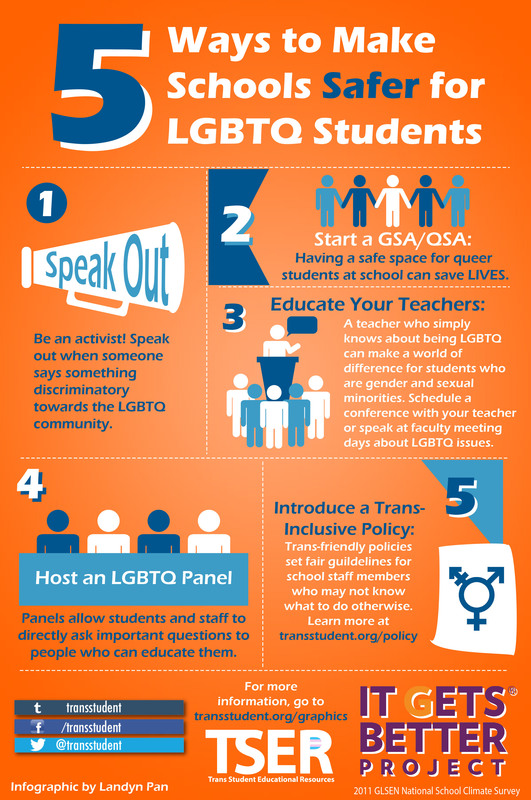 GSA Network is a LGBTQ racial and gender justice organization that provides training for youth and resources for teachers and advisors. Downloadable best practice guide from Teaching Tolerance.